Offshore Wind Costs: Toward a Zero-Subsidy Era? 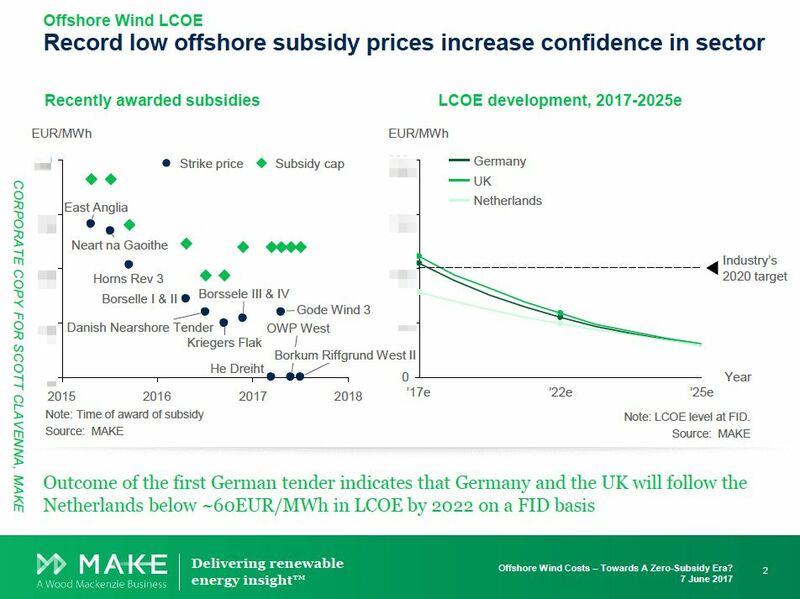 The wind experts at MAKE look at the increasing trend toward unsubsidized offshore merchant wind power. Offshore wind equipment is reaching record heights and unforeseen low costs that are allowing it to be deployed with fewer and fewer subsidies. MAKE Consulting (which recently joined the GTM and Wood Mackenzie family) has a new analyst note that further illustrates the increasing competitiveness of offshore wind. Here are a few recent and relevant data points. Denmark's Dong Energy, a leading offshore wind player, won two large wind tenders in the German North Sea unaided by any direct subsidies (although German ratepayers are footing the bill for interconnection to the grid, not an insubstantial cost, and that does amount to a subsidy). With a combined capacity of almost 1.5 gigawatts, the Dong wind projects (and a project from German utility EnBW) are zero-subsidy bids, meaning that these North Sea projects are pure merchant power efforts. One of Dong's new projects, the 1.2-gigawatt Hornsea site, will be the world’s largest offshore wind farm when completed. The U.S. saw its first offshore wind installation last year off Block Island, Rhode Island, a small project of 30 megawatts. New York hopes to deploy 2.4 gigawatts by 2030, and Massachusetts is preparing for its first offshore wind procurement this month. A small firm called Offshore Energy is proposing an enormous 2-gigawatt, $8 billion wind project off the coast of Gippsland, Victoria in Australia to help replace shuttered coal plants. It's still in the feasibility study stage, as reported by The Herald Sun. The cost declines in wind come from continued improvements in technology and installation techniques. As Sonal Patel of Power Magazine reports, "Costs for offshore wind in Europe have fallen 50 percent in two years." Costs began tumbling in 2015, when the industry boasted of a then-record-low cost of $111 per megawatt-hour at Denmark's Horns Rev 3 wind farm. Just 18 months later, Borssele 3 and 4 in the Netherlands was priced at $61.23 per megawatt-hour. MAKE sketches out where the industry stands in this chart -- and shows that it's ahead of schedule on price. 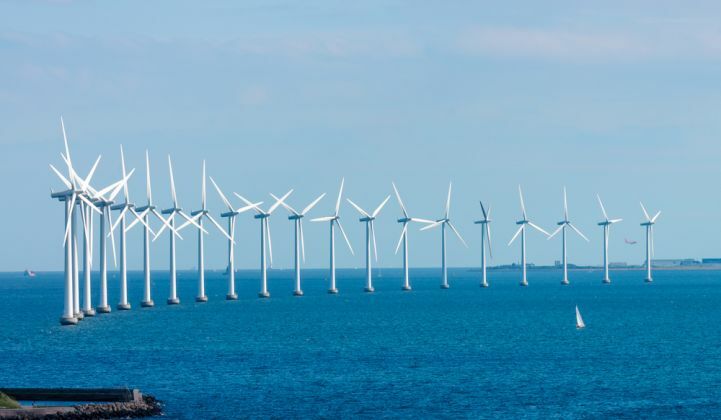 As GTM's Jeff St. John reported, McKinsey has reached similar conclusions about offshore wind -- fast growth, increased investment, bigger wind farms, falling costs and new technologies are driving new project bids to record lows in Europe. McKinsey cites a recent bid in the Netherlands at $61.10 per megawatt-hour and a winning Danish bid of $55.94 per megawatt-hour. St. John adds: "In a German auction in April, the average winning bid for the projects was far below expectations, with some bids coming in at the wholesale electricity price -- meaning no subsidy is required." GTM's Stephen Lacey reports that Vestas just released a 9.5-megawatt offshore turbine that is "two to three times bigger than the standard turbines from only a few years ago." McKinsey predicts that 13- to 15-megawatt models could hit the market by 2024. Germany's Senvion has plans for a 10-megawatt offshore wind turbine, according to WindPower Monthly, which notes that researchers are toying with the idea of 50-megawatt capacity turbines. McKinsey notes: "This reduces the cost per megawatt. Even as turbines have become larger, they have also become better. In the 1990s, the expected lifetime of offshore wind parks was only 15 years; now it is closer to 25 years, and new sites project an operational lifetime of 30 years." There are innovations in foundation design with new construction methods including building the turbine onshore and floating it out to sea. Offshore wind still costs about 40 percent more than onshore wind. But the cost of financing offshore has gone down as investors gain more confidence in the technology. Europe leads in offshore wind by a long shot, followed distantly by China, Japan and the U.S.
Will cheap offshore wind ever make a dent in America? Listen to our conversation with Foley Hoag's Alicia Barton on The Interchange podcast about new activity on the East Coast.